Brief biographies of the 18 pioneer market gardeners who arrived between 1926 and 1928 and links to family members who have been interviewed for the oral history project. Recordings of interviews with the sons and daughters of the pioneer market gardeners, relatives, and other people closely connected to the area. Information related to other market gardeners living in the area and who would have interacted with the pioneer families. This includes the families of two returned Anglo-Australian WWI soldiers who worked soldier settler blocks on the River Torrens. Images, documents and other graphic information related to the people who are the subjects of the oral history project. Interviews with mostly second generation Italian Australians who were born in Australia and now live in Italy. These interviews were recorded in Italy in 2018. 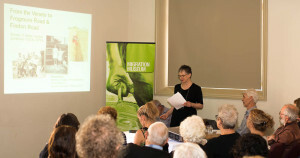 Information has been translated into Italian in many of the sections to reflect the transnational aspect of the Veneto market gardeners oral history project. Currently Madeleine Regan is undertaking a PhD. related to this project. The research section presents some of her research activities. The information in this section is of an academic nature. The blog allows for reader to be kept up-to-date on the current situation with the project and provides a means for people to comment and make suggestions regarding the project. Madeleine Regan is the Principal of ideas and words. She undertakes community history projects, records oral histories, conducts research, develops web content and publishes life story books on commission.